BICEP2 is a powerful upgrade of the existing BICEP1 experiment, a bolometric receiver to study the polarization of the cosmic microwave background radiation, which has been in operation at the South Pole since January 2006. BICEP2 was deployed to the South Pole in November of 2009. The heart of the receiver is a 512 TES detector array (256 dual-polarization pixels, ~5 times more than BICEP1’s). 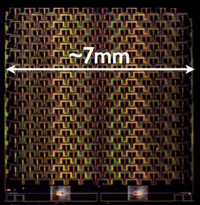 The focal plane contains four silicon tiles, each photolithographically patterned into an 8×8 array of spatial pixels. A spatial pixel consists of two interleaved arrays of slot antennas, one each for the two perpendicular polarization components of incident light. A summing tree of microstrip transmission lines link each array of slots to form a single antenna. The output of each antenna passes through an on-chip band-deﬁning ﬁlter and terminates on a superconducting transition-edge sensor (TES) bolometer. On left, the slot antenna. On right, the TES. These large TES focal plane arrays provide an unprecedented sensitivity and excellent control of foreground contamination. Design based on Free CSS Templates.